New Zealanders are fortunate to live in such a unique and captivating land. There are plant and animal species that are found nowhere else on the planet but live here in a land that is both clean and beautiful. Every person can make small contributions towards maintaining the beauty and richness that surrounds them. 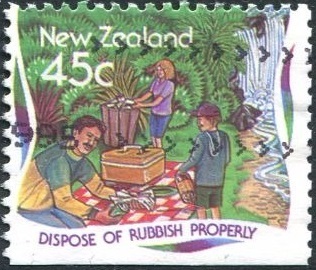 The importance of caring for our environment is depicted in this Environment stamp issue. 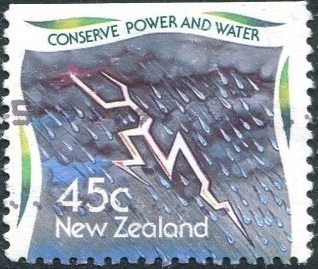 The issue appeared in a 10 stamp booklet, a popular way of issuing stamps during the 90s. Below are the booklet cover and the sheet of stamps. 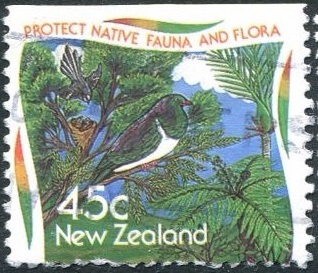 The stamps came in vertical pairs with an environment featured on the top stamp and suggestions on how we can protect it on the bottom stamp. 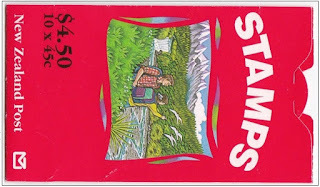 Not being able to find good mint images I have gone with used stamps. 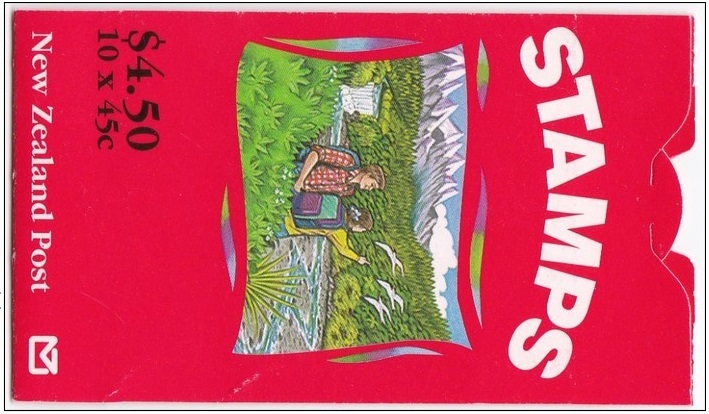 Personally, I don't mind used stamps as they show the real purpose of a postage stamp. We also couldn't find captions for these stamps so I'm just adding something as we go along. Protect our native fauna and flora. 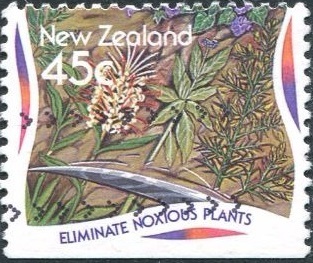 New Zealand has some unique birds, plants and trees which need to be protected and managed. DOC does a lot of this work but, as this stamp issue points out, this responsibility lies with us too. At the time I am writing this, in 2018. a disease known as Kauri Dryback is killing many of our kauri trees. While DOC and other organisations are fighting to prevent this disease from spreading we must do our part too by keeping out of closed areas and obeying the rules of foot washing etc where the parks are open. Control animal pests that destroy the environment. 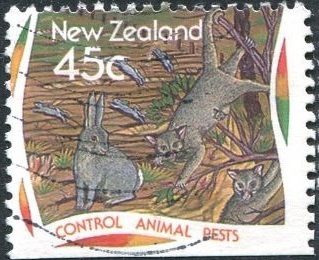 The two shown here are rabbits and opossums. We could include larger animals such as goats, deer and pigs. Or birds such as Australian parakeets and parrots. They all have an effect on our environment and the native plants and animals that live in it. Plant native trees and shrubs. 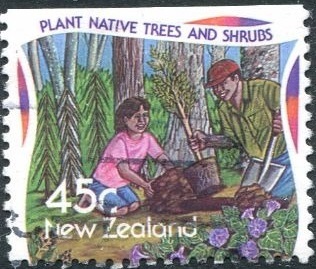 One way of helping New Zealand's unique fauna and flora is to plant native trees and shrubs. This helps the survival of these native plants while providing habitat for native birds as well. Eliminate noxious plants that kill native plants. I have a creeper that has got into my garden. It climbs all over the native plants and trees and will eventually kill them if I don't do something about it. I think it came as a tiny weed on some plants we brought. Now it is proving a battle to get rid of it. Perhaps it would have been better if I had been more careful in the first place. 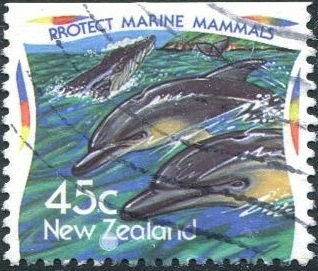 At one time the killing of marine mammals such as whales was an encouraged industry in New Zealand but now we realise how much damage it has done, putting many fine animals on to the endangered list. 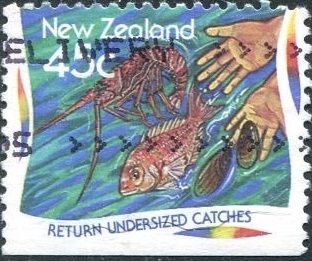 Fortunately, today many of these sea creatures are protected within New Zealand oceans. While this has helped, still more needs to be done in encouraging the population growth of these amazing Marine Mammals. Protect our fisheries from overfishing and exploitation. The taking of undersized fish doesn't give them a chance to breed. In this way, quickly an entire generation could be wiped out and the resource, the fish species could be lost. We also need to watch fishing trawlers coming into our fisheries from overseas, both legally and illegally as they have been known to take everything, regardless of its size. Two of our biggest needs is power and water. Recently, during the power cuts in West Auckland following that big storm, we were without power for more than a week. If that wasn't bad enough, our water is collected in large tanks and pumped inside as required. No power, no pump, no water. There were thousands of litres of water and we couldn't get to until we found a workaround. During that time I got a very clear picture of how life is without those two resources. Control Air and Water Quality. 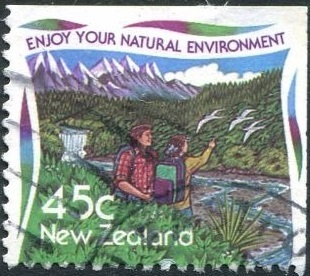 Air and water pollution, two of the biggest problems facing the modern world, New Zealand included. Sources of air pollution are industry, smokestacks and chimneys, road vehicles, weed and other sprays. Sources of water pollution include farming, industry, water runoff from city, industrial and rural areas. 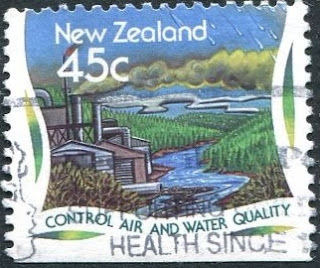 I sure you can think of more examples of these but I think I have made the point of this stamp regarding the protection of our air and water quality. New Zealand is a beautiful country, full of scenic beauty of our natural environment. By getting out and seeing this beauty we engage in healthy activities such as walking, hiking and swimming while at the same time getting a better understanding of how precious our natural environment is. But this human activity needs to be managed in such a way that little or no damage is done to our beautiful country. A popular sign in our parks say "Take only photographs - leave only footprints." In 2018 this has become part of the bigger problem of plastic. In New Zealand, we are encouraged to recycle waste as much as we can with cardboard, plastics and cans being collected for recycling but it is becoming clear that this is not going to be enough. An effort needs to be made in not creating the waste in the first place. Look at removing the use of plastic bags for example. Some supermarkets are already working towards doing this but other businesses need to get on board too. Designer: Niki Hill, Whakatane, New Zealand. Printer: Southern Colour Print, New Zealand. Stamp size: 30mm x 25mm. Sheet size: Booklets of 10 stamps. Paper type: Harrison and Sons, red phosphor coated, unwatermarked. 2018 - Predator Free 2050.